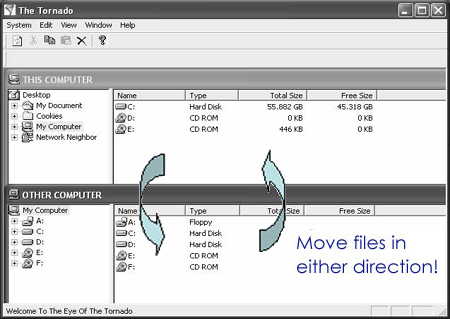 Once connected to each PC, The Tornado™ automatically displays the entire contents of each PC enabling the user to quickly drag-n-drop their files and file folders from one machine to the other. Operating at USB 2.0 speeds, The Tornado™ moves files 600 % faster than standard flash memory-based storage media. 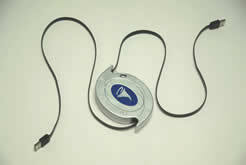 The Tornado™ is pocket-sized and has retractable cables allowing it to be easily carried anywhere. 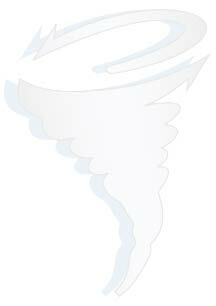 "Just Tornado It On Over"
Use it over and over on multiple PC's! The easy to use graphical user interface autoloads by simply plugging the device into the USB port of each computer. The flashing LED light on the top of the device lights up to let you know that you're connected. The entire contents of each PC are clearly displayed on the screens of BOTH COMPUTERS. Then you simply drag-n-drop files or entire directories from one machine to the other. It's bi-directional so it doesn't matter which machine you use to transfer the data. Just The Tornado™! Pocket size and only 4.8 oz. * Windows 98SE operating system does not support the auto loading of drivers. To load the necessary 98 driver, click here or come back after you purchase your device and download the driver for free.